A number of people in real life and online have asked me about blogging. There’s already a lot of information available out there. My goal in covering blogging isn’t to replace the other topics on FP2P or reinvent any wheels so to speak. I’d like to share with you more of my journey in growing FP2P and help you with blogging if that’s your side hustle too. 1) I reviewed the Pinterest Launch Plan by Jennifer Maker Marx and talked about how I’m currently using it to grow my traffic. This is after growing so frustrated with Pinterest over the past year and just about giving up on it. You can read my review here. 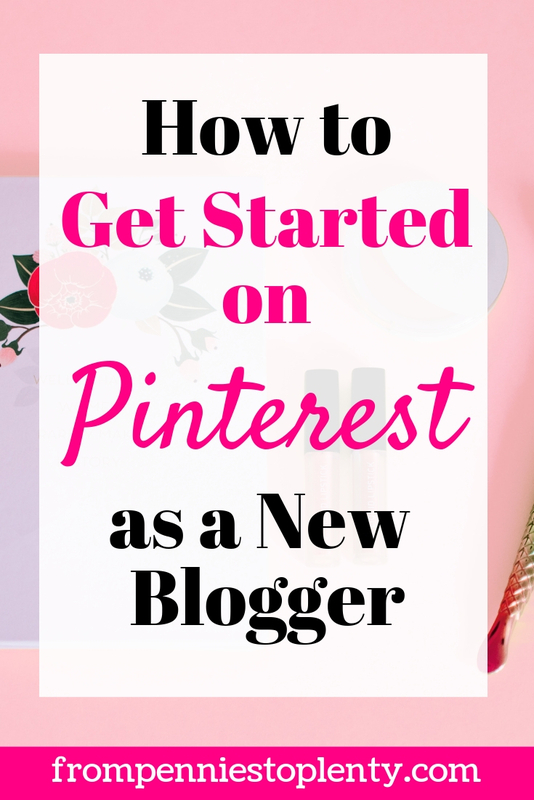 2) This post is about the basics of Pinterest for the new blogger getting started this year. 3) This post here is about the keys to making a visually appealing Pinterest pin. I’ve done a lot of learning about Pinterest over the past year or two. I’ve taken free and paid courses, watched webinars, read cheat sheets, attended blogging conferences, and conversed with other bloggers about Pinterest. Pinterest can be a giant puzzle. Some people attempt to use Pinterest but never gain traction, meaning they don’t see an increase in their blog traffic given the amount of time and effort they spend on it. This can be overwhelming, frustrating, and ultimately defeating. I wasn’t that far off from that myself until I redid my Pinterest account starting with implementing some of these Pinterest best practices for bloggers. The first thing to do is set up an account. You can provide an email address and create a password or use your Google or Facebook logins. Use your blog name as your Pinterest username. My blog is From Pennies to Plenty, so I made that my username. You can use your actual name if your blog is named after you. This is important so that your Pinterest page URL will have your blog’s name in it. For example, mine is www.pinterest.com/frompenniestoplenty. Don’t worry; you can change your username later if you need to for whatever reason. You’ll want to join Pinterest as a business account rather than a personal account. It’s free to get a business account (see how here), which gives you access to analytics so you can see how your account is performing. Pinterest requires you to claim your website to verify its authenticity. You can read these instructions on how to claim your website. This allows your profile picture to appear with pins from your site and a few other things. Rich pins are another feature available to business accounts. Rich pins provide more information right on the pin as it appears. There are four types of rich pins available: product, recipe, article, and app. My pins fall under the article type because I write blog posts. Article pins show a highlighted headline, the author, and a description or start of the post. You can learn more about rich pins here. Put the name of your blog followed by some keywords. I put my blog name From Pennies to Plenty and the keywords “personal finance” and “frugal living” because those are the main topics of my blog. There is now a 30-character limit. You can currently work around that by writing your description on mobile. You want people to know what your blog is about in an instant. This is especially true if your blog name doesn’t make clear what you blog about. If someone is scrolling through a list of people looking for who to follow or information on a topic, she’s not going to spend time clicking through to your profile and blog to figure out what you’re about. You want that person to know immediately if you’re what she’s looking for or not. This section also tells Pinterest what your business is about. Pinterest can then recommend you to people who are searching for your topic. Therefore, it’s important to code this section with more keywords about your blog topics. You’ll see I added a lot more keywords such as “money saving tips”, “budgeting tips”, and “side hustle ideas” because those are all primary topics on my blog and popular searched topics on Pinterest. Choose a picture of yourself that shows your face. This shows that you’re a real person behind the blog. If you don’t want to put a picture of yourself, try using your logo. You’ll want to put something that is recognizable to your readers as they see it over and over again. Despite the common idea that Pinterest is a social media platform, it really works as a search engine. Think about how people use sites like Google. People type in their queries that contain a question or at least a keyword. You’ll want your results to show up when people search for your topics on Pinterest. That’s why it’s important to use keywords in everything. If you use funny names or catchy phrases that aren’t commonly known or used, people will not find you. They won’t see your pins and make their way to your blog. I use keywords in all the following areas. The Pinterest Launch Plan, which I wrote a review about here, goes into more detail about how to use keywords. Now it’s time to create some boards. It’s good to start with at least 10 boards. This shows that you’re established and not just dabbling on Pinterest. The board names should correspond with your blog topics and related topics. It’s okay if you’re still figuring out your blog’s topics. Go ahead and create some boards based on what you already cover or think you will cover. You can always change the titles and descriptions of your boards later. If you already have personal boards set up on your account, set them to private so only you see them. Your Pinterest page should be on brand, meaning that all the content a visitor sees is relevant to your blog. Below is a screenshot of some of my boards. You’ll see that they’re all related to personal finance or topics that I’m covering. Some of the titles could be considered keywords. The boards’ descriptions all have keywords in them. Note: I put FP2P in the title of my own boards. This is not necessary. I do it to visually keep better track of my own boards versus group boards. It’s also easier for me to pull up my boards to I search for specific ones when I do manual pinning. Pinterest is a visual platform, so you’ll want to have appealing images. Once you have your boards set up, fill them in with both your pins and other people’s pins. I used to be terrible at making pins. It would take me about 30 to 45 minutes to make just one pin. I would search and search for images and then couldn’t decide which to use. I couldn’t figure out what fonts I should use. It was a struggle to make my pins both pretty and legible. Use a service like Canva or PicMonkey to create your pins. They’re so much easier than trying to figure out Photoshop. They even have templates you can use for your pins (Canva’s here). Both have free versions and paid versions. I still use the free version and it works for me. Use bright colors. Brighter pins tend to perform better because they stand out in a sea of pins. That doesn’t mean that a dark pin can’t do well. I still use dark colors from time to time depending on a picture I’ve found or a post topic. If you’re just starting out though, go with bright colors to give yourself as much of an advantage as possible. Use a larger font size. Your pin needs to be eye-catching and legible on small screens like cell phones and tablets. Test out your pins by looking at them on your phone. Scroll down through yours and other people’s pins. Can you still see yours? Can you read it? Create vertical pins. Pinterest strongly favors vertical content. The latest word from Pinterest last year said that they favor the 2:3 ratio. I typically make my pins 735 x1102 px because that’s the given setting in Canva. When you’re a new blogger, you may not have specific colors and fonts and keywords that you use consistently. That’s okay! Keep trying out different things until you find what fits your brand and helps you gain traction on Pinterest. No one expects a new blogger to have it all figured out. You can write a description for your pin when you post it to Pinterest. You don’t want to accept just anything that defaulted into the description box. Sometimes it’s just the file name of the picture. Boo! This is the perfect opportunity to help Pinterest and your viewers understand what your blog post is about. Pinterest needs those keywords to categorize your pin correctly. Write a description that’s complete with keywords and a call-to-action. In the screenshot below, you’ll see that I used keywords such as “spend less”, “save more money”, and “money goals”. I also told the reader to check out the post. I’ll add even more keywords next time I post this pin. 8 | Keep on pinning! I think of Pinterest as a baby that is always hungry. It cannot be fed enough! Pinterest wants new content all the time. I’ve heard recommendations to pin as few as 3 of your own pins to as many as 60 pins total (both yours and others) a day. Can you imagine stopping what you’re doing to pick up your phone and pin 60 times throughout the day? You’d never get anything else done. But being consistently and strategically active on Pinterest is the best way to grow your Pinterest traffic. You can’t just pin a few times on one day and come back a few days or a week later and pin some more. You may get dribbles of traffic but you won’t build consistent blog traffic from Pinterest that way. I use Tailwind, a Pinterest-approved pin scheduling program, to publish my pins for me. I pin about 30 pins a day consisting of both my own pins and other people’s pins. I don’t have time to do it all manually. I spend a few hours every 1-2 weeks scheduling my pins for those next 1-2 weeks and then let Tailwind do its work as the days pass. Tailwind has been a lifesaver; I could not optimize the Pinterest platform without it. Tailwind offers a free trial that lets you schedule and publish up to 100 pins. You also get access to 5 Tailwind Tribes and 30 pins to submit to those tribes. (Tribes are essentially Tailwind’s version of group boards). There’s no time limit on how long you have to use your free trial. Ideally though, you’ll use them up sooner rather than later to gauge Tailwind’s effectiveness for you. I shared in a previous post that I received a lot of foundational knowledge about Pinterest through free materials available online. I was able to set up my Pinterest account but didn’t see it grow the way I wanted to. For most people, just setting up an account as described in the steps above and using Tailwind will get you increased traffic, but you may not see your numbers skyrocket without using an additional strategy. I was so frustrated with months of slow and fluctuating growth that I wanted to give up on Pinterest. That’s when I purchased and implemented the Pinterest Launch Plan by Jennifer Maker Marx. The plan taught me how to go about scheduling my pins strategically and tracking them in order to grow my Pinterest traffic. I’ve used it for two months so far and my Pinterest numbers and blog traffic numbers have shot up. Pinterest is now my number one source of traffic! You can read more about the Pinterest Launch Plan here and my review of it here. I’m now experiencing the benefits that Pinterest can bring a blogger (yay!) and want the same for you too. The last thing I want to point out is that Pinterest is a long game. On top of using the above tips and finding a strategy for growth, you need to give Pinterest time to really work for you. Stick with Pinterest for at least 6 months. You will see short-term improvements by using the PLP mentioned above even at the start of your Pinterest use if you didn’t already use a strategy. In order to see long-term, sustained success on the platform, you need to keep working on Pinterest consistently day after day. This is covered in the PLP too. There’s no magic to Pinterest success. You’ll find it work for you with the tips here and some smart strategy. There’s a lot more to learn about Pinterest now and in the future. It’s always changing as it tries to meet the needs of content creators and consumers. 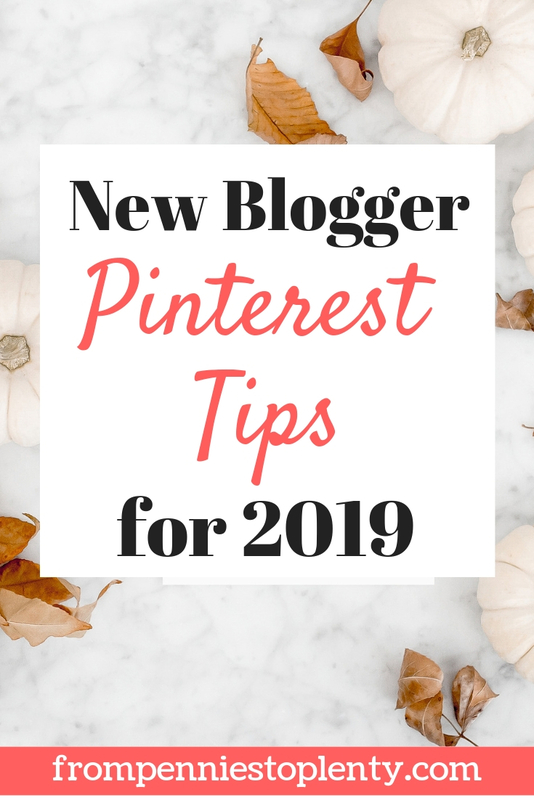 For now though, I hope you enjoyed learning about how to get started on Pinterest as a new blogger in 2019. I’d love to hear your thoughts and reflections on Pinterest and this post.